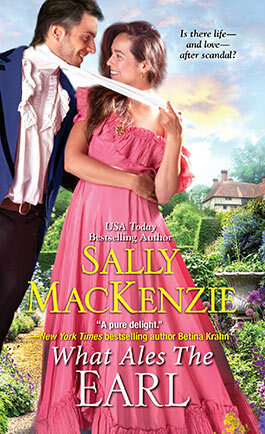 "A fun, heartwarming Regency romance elevated by witty dialogue and a unique concept." "What Ales The Earl is a pure delight. Sharp dialogue, a creative premise, and plenty of tugs on the heartstrings. MacKenzie knows how to craft a story that will keep us up at night. Her characters jump off the page—right into the reader’s heart." 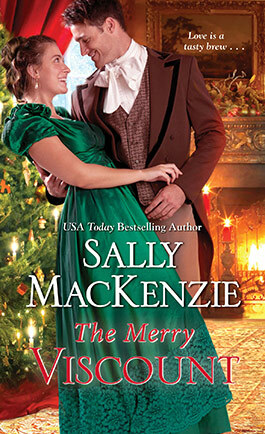 "A charming, traditional Regency romance with an effervescent twist!" Harry Graham, Earl of Darrow, stood in the Duke of Grainger’s music room and listened to Lady Susan Palmer, the Earl of Langley’s daughter, talk about . . . something. Ah. A dress she’d seen at someone’s ball—Lady Norton’s?—during the Season. She had a very English sort of beauty that he’d missed in his years on the Continent. Porcelain skin. Blond hair. Blue eyes. Dark blue, not the light, clear blue of Pen’s . . .
How was Pen? She must be married and a mother several times over by now. He’d hoped to see her when he’d come home to England—just as old friends, of course—but he’d discovered she’d left Darrow not long after he had. He hadn’t asked any more questions. It might have looked odd for the new earl to be inquiring about a tenant farmer’s daughter. Someone might remember how much time they’d spent together that summer before he’d left to fight Napoleon. Not that there’d been anything particularly scandalous about their affair. His brother, Walter, had certainly sown his share of wild oats among the local maidens, many of which had taken root. He’d had so many bastards, people had given them a name—“Walter’s whelps.” It was easy to pick them out—they all had the distinctive Graham streak, a blaze of gray hair among otherwise dark locks. He frowned. He didn’t like to compare himself to Walter on any front, but particularly this one. He wasn’t a monk, but he hoped he treated his paramours with more respect than Walter had. At the very least, he was careful not to gift them with a child. Walter hadn’t been the only one frequenting the maidens’—and matrons’—beds. Felix, the blacksmith’s son, had given him stiff—ha!—competition. It had been so bad that far too often, no one, including the mother, knew which man was a new baby’s father until the Graham streak showed up, if it did. It had been better for all concerned when Felix was the father. Then, if there was a husband involved, the man might never realize he’d been cuckholded. Harry still remembered all too vividly the time one of the tenants had come, pitchfork in hand, to find his older brother. Usually, the Graham steak appeared by the time a child was two or three years old, but this man’s firstborn son’s hair hadn’t shown its silver blaze until his tenth birthday. His attention snapped back to Lady Susan. Good Lord, he had no idea what she’d been rattling on about. He was losing his touch. He’d never been so unaware of his surroundings when he’d been working for the Crown. He had to keep his mind focused on matters at hand. He’d promised Mama he’d propose to the woman, after all. He was planning to pop the question tonight. “Marchand,” he said, correcting her and giving the name its French pronunciation. Apparently, she was still droning on about dresses. If I take her into the shrubbery, at least she’ll stop talking. He kept one ear on Lady Susan’s monologue while his thoughts drifted off again, this time to the French dressmaker. He’d visited Bernandine a few times when he was in London. He liked to practice his French—and other skills—with her. But once he married . . . There was no need for any of his habits to change when he married, especially not if his wife was Lady Susan. She’d likely thank him to take his male lust somewhere beside their marital bed. And he was going to marry Lady Susan—if she would let him edge a word in. He’d never met a woman who could talk so fluently about nothing. Do I really want to wed such a jabberer? No, he didn’t, but he didn’t have much of an alternative. She was the best of a bad lot. His mother had laid the matter out quite clearly the moment he’d set a foot back in Darrow Hall after almost ten years abroad. He had to marry and get an heir as soon as possible. He’d been in Paris when he’d got word that Walter had broken his neck going over a jump. Zeus, he’d never forget how he’d felt when he’d read that letter. It had been as if someone had administered a flush hit to his breadbasket and followed it by dumping a load of bricks on his head. I never expected to be earl. I never wanted to be. He’d liked the life he’d built for himself. He’d spent the last decade in Portugal, Spain, France, Austria, living by his wits, dealing in ideas, in stratagems and politics, not in crops and drainage ditches and leaky roofs. But he was the earl now and with that came the duty to continue the succession. And Walter’s death had proved all too conclusively that no one was guaranteed another day on this earth. Which Mama had pointed out most emphatically. He needed an heir, she’d said bluntly. There was no time to delay. Walter had been only thirty-five, and here he was, dead. And, as Walter had also illustrated all too well, Harry couldn’t be assured of having a son on his first attempt. Or his second. Or third. His sister-in-law, Letitia, had produced a baby a year: Adrianna, Bianca, Cassandra. Likely she and Walter would have carried on through the alphabet until they’d got a boy if she’d been able, but she’d lost the last three pregnancies and then, if rumor was to be believed, had refused to let Walter back into her bed. So, Mama had handed Harry a list she’d made of eligible women, young females with the proper pedigree and several brothers. All he needed to do was choose one, marry, and get down to swiving his brains out. Well, Mama hadn’t said that last part, at least not in so many words. But her message had been painfully clear: the sooner he got an heir and a spare, the better. She’d wanted him to make his selection on the spot, picking a name off the list, but he’d insisted on meeting the women first. They’d all still been in the schoolroom when he’d left England. So, they’d compromised. Mama had agreed to let him take a Season to shop the Marriage Mart without constantly badgering him. And he’d agreed to make his choice once the Season was over. The Season had ended in June. He hadn’t encountered a single woman who made his heart—or even his baser organ—long for a closer relationship, but he’d given his word. He had to choose one. Lady Susan would do as well as any other. Better, perhaps. At least she was in her early twenties, older than most of the others on the list. Mama would have preferred he choose a debutante—she’d argued that he’d get more breeding years from a girl in her late teens—but he couldn’t stomach the thought of taking what to him felt like a child to bed. And since, as far as he could discern, Lady Susan harbored no tender feelings for him, she wouldn’t be offended by his inability to feel any affection for her. He only hoped he didn’t go deaf from her constant chatter. At least she was pleasant to look at. And Darrow Hall was a big place. It wouldn’t be hard to avoid her there, and when he was in London, he’d spend all his time at his clubs. Except for the obligatory swiving. With luck, he’d get her with child on their wedding night, and their first two children would be male. Lady Susan’s fashion commentary showed no sign of abating, but time was marching on. He could feel his mother’s and his sister-in-law’s eyes boring a hole in his back. It was the last day of the house party. He was supposed to invite the woman for a stroll in the vegetation where he would perhaps steal a kiss and discover if she was agreeable to him asking her father for her hand in marriage. Of course, she was agreeable. She wouldn’t be at this infernal party if she wasn’t. Her father was likely sitting in a room somewhere, waiting for him to make his appearance. His stomach twisted, and he took a settling swallow of brandy. He’d faced worse assignments during the war. At least he wouldn’t die from their trip to the garden—unless he drowned in her never-ending stream of words. The sooner he married and got a son, the sooner he could reclaim his life. He wasn’t looking for a love match, after all. Hell, he wouldn’t know love if it bit him on the arse. What I’d had with Pen had felt very much like love . . . .
Ha. He’d been eighteen. What had he known of love? Nothing. His feelings had been lust, pure—very pure—and simple. This union with Lady Susan would be a typical marriage of convenience. A business arrangement: a title, prestige, and wealth in exchange for a son or two. It was a very common sort of thing among the ton. Once his wife—once Lady Susan—completed her side of the bargain, she’d be free to go her own way as long as she took sensible precautions. He just hoped he’d be more efficient than Walter at getting an heir. And then a bolt of lightning lit the room, followed by a great crack of thunder and a torrential downpour. God had saved him. There would be no stroll in the garden tonight. The Lord had even managed to stop Lady Susan’s chatter. Was he now doomed to listen to an accounting of every raindrop that had ever hit Lady Susan’s lovely head? No. The Duke of Grainger came over to finish what the Almighty had begun. Harry glanced around, surprised to see that almost everyone else—except his mother and sister-in-law and old Lord Pembleton, sipping his sherry in a corner by the potted palm—had left. Then why did you drone on about dresses? Harry opened his mouth, not entirely certain what words would come out, but Grainger clapped him on the back and spoke before he could. And with that he hauled Harry away. Harry had never been one to allow himself to be led anywhere, but he also wasn’t an idiot. He could see salvation when it was dangled before him. He went meekly—and quickly—along until they were in Grainger’s study with the door firmly closed. “Zounds!” Harry collapsed into one of the leather chairs by the hearth. Grainger was making rather too much of the matter. “So then why did you invite her to this house party?” Granted, this had not been the usual ton country gathering. The guests were older—none of the just-out-of-the-schoolroom girls here. A few were widows with young children in tow, which would make sense if Grainger was considering remarriage. Grainger’s wife had died several years ago, just days after their son was born. Harry almost snorted brandy out his nose. “I wouldn’t say that.” Though if he were being brutally honest, he didn’t completely disagree with Grainger. I can’t really prefer death to marrying Lady Susan, can I? Grainger cocked a skeptical brow, but didn’t argue the point. “Don’t you have a cousin or some relative who will inherit if you should meet an untimely end?” he asked instead. “Ah. Now that would be quite the calamity, wouldn’t it?” Grainger said with a perfectly straight face. Of course, Grainger wouldn’t see the problem in letting . . . Harry wasn’t even sure of the fellow’s name who was next in line to be earl. Searching among the distant leaves of the family tree was precisely how Grainger had succeeded to his title. Until early this spring, he’d been merely Edward Russell, London solicitor—and then the fourth Duke of Grainger, along with his wife and children, had died suddenly and unexpectedly of influenza. Grainger’s other brow rose as well, and then both settled into a frown. Clearly, he was biting his tongue. Well, Grainger wasn’t saddled—er, blessed—with female relatives. “Don’t make it bleed,” Harry said. Grainger grinned. “And it’s not just them, of course,” Harry continued. “I have a responsibility to all the people on the estate.” He might not have given a thought to being earl, but his years in the army and working for the Crown had impressed upon him the need to look out for the people who depended on him. Harry grunted and took another swallow of brandy. He’d never been enthusiastic about offering for Lady Susan, but now suddenly he felt trapped. Blast Grainger for cracking open the door to his prison. He was very tempted to bolt. It must be the brandy’s fault. Grainger poured them more brandy. If Harry were the suspicious sort, he’d suspect the duke was trying to get him drunk enough to disregard the urgings of his better, more responsible self. Harry might have growled, because Grainger smiled. I shouldn’t rise to the bait . . . .
Grainger reeled him right in, though at least the duke permitted himself only the smallest smile as he did so. Harry nodded. Darrow’s books hadn’t been that bad, but it was always a challenge to jump into the middle of matters with which one had no previous experience. “And I do.” Harry could see where this was going. The thought of getting away from Mama and Letitia—and Lady Susan—and getting back to a semblance of his old life, even for a short time, was extremely appealing. It will only be for a few days. Lady Susan won’t marry someone else that quickly. It was rather telling that the thought she might came with a jolt of relief. I’ll take this one last frolic and then I’ll settle down to be a model earl. Penelope Barnes sat next to her daughter, Harriet, and studied the vicar as he climbed the steps to the pulpit. Single men aren’t thick upon the ground in Little Puddledon, you know, she reminded herself sternly. Godfrey is your best—your only—chance of getting Harriet out of the Home. She would do anything for Harriet, even marry Godfrey. And, really, what did it matter? Harry Graham was the only man who had ever made her heart beat faster. She must be sensible, and Godfrey was a sensible choice. At thirty, he was old enough to have put aside youthful foolishness but not so old that he was teetering on the edge of his dotage. A hideous image of Godfrey naked and approaching their marital bed sprang unbidden and far too fully formed into her mind. Bile rose in her throat. Old and feeble might be better. Nonsense. She frowned and sat a little taller to banish the sinking feeling in her stomach. She’d like to give Harriet a sister. She’d been an only child herself and had always wanted a sibling. Godfrey was a man of the cloth, focused on the spiritual rather than the physical realm. He must have mild appetites. In all likelihood, she’d have to do her conjugal duties only infrequently—just often enough to conceive. If she was lucky, they’d accomplish that goal on their wedding night. She was more than willing to undertake any other wifely duties in exchange for a roof over her head and Harriet’s. A roof that did not also shelter Verity Lewis. Pen jumped and looked at her daughter, though not before she saw Godfrey freeze midword and swivel his head toward them. Blast! She couldn’t have the man taking a disgust of Harriet now. Her strong-willed daughter gave no sign she noticed the attention. Her entire focus was on Verity, the eleven-year-old girl sitting in the pew behind them. Verity’s eyes were demurely studying her hands clasped loosely in her lap. She was the picture of innocence—if one ignored the faint smirk on her lips and the fact that Martha Hall, Verity’s main partner in crime, was giggling next to her. Dear Lord, what has that girl done to Harriet this time? Verity was the reason Pen needed to get Harriet out of the Benevolent Home for the Maintenance and Support of Spinsters, Widows, and Abandoned Women and their Unfortunate Children as soon as possible. Pen had been toying with the idea of marrying Godfrey since shortly after he’d arrived in the village that spring—she’d been getting very tired of sharing a house with so many women and had wanted Harriet to grow up in a real family. But in the days since Verity and her mother, Rosamund, had stepped through the Home’s door, her resolve to bring Godfrey up to scratch had hardened. She’d tried to give Verity the benefit of the doubt. New girls often had a difficult time adjusting to the Home. Verity and Rosamund had only been there ten days—yes, Pen had been counting—but each day had been worse than the one before. Verity was turning all the other girls against Harriet. Each snigger, every rude whisper, infuriated Pen, and the hurt and confused looks on Harriet’s face lanced her heart. She’d managed to hold on to her temper until yesterday morning when she’d overheard Juliet Walker, Harriet’s best friend—her only friend at this point—tell Harriet that Verity said she couldn’t play with her anymore. The memory still made Pen’s blood boil, even here in the Lord’s house. And she’d swear something else had happened this morning. Harriet had been unusually subdued when she’d come out of the dormitory to go to services. Harriet’s blue eyes—so much like her own—flashed. “Verity pulled my hair, Mama,” she said in a furious whisper. Pen couldn’t help it—she glanced back at Verity. She forced herself to take a calming breath. Much as she’d like to box Verity’s ears, Verity was only a child—an obnoxious, scheming one, perhaps, but a child nonetheless. “Perhaps it was an accident,” she said. Right. Neither she nor Harriet believed that. Pen put her hand on Harriet’s arm, certain she could feel Godfrey’s frown piercing through the back of her head. Whenever he disapproved of something—which unfortunately was rather often—his nostrils flared and then his nose wrinkled up as if he’d caught a whiff of Farmer Smith’s pigs. Harriet’s brows angled down so steeply they almost met, and her lower lip pushed out in a furious pout, but she held her tongue, thank God. No, he was delivering an insightful . . . er, an interesting . . . well, an earnest . . .
Oh, why dissemble? Godfrey’s sermons were an invitation to untether one’s mind and let it wander where it willed. She pasted a rapt expression on her face—at twenty-seven, she’d perfected the skill of masking boredom with a false façade—and mulled over her problem. Even if she could get Godfrey to propose today, they would have to wait three weeks for the banns to be read. She couldn’t let Harriet suffer that long. Something had to be done about Verity today. She’d mentioned the matter to Jo after the incident with Juliet—the Home was Jo’s creation and she oversaw all its operations—but Jo was a bloody saint. She’d counseled patience and understanding. Turning the other cheek. Bugger that. This was Harriet she was talking about. Jo didn’t have children so she couldn’t understand how fiercely the need to defend Harriet burned in Pen. She’d stand up to the Prince Regent himself to protect her daughter. I’ll even threaten to leave the business if I have to. She stiffened. That thought hadn’t occurred to her before. A yawning hole opened in her stomach. The Benevolent Home had been the branch she’d grabbed just as life had been threatening to sweep her and Harriet over a cliff. If Mrs. Simpson, Aunt Margaret’s friend, hadn’t told her about the place the day after Aunt Margaret died, Pen would have been sleeping under a hedgerow with her eight-month-old baby. Her arrival had been good for the Home, too. She’d known enough about farming—her father had often been too drunk to tend their own fields so those duties had fallen to her—to manage the orchards and other crops and nurse the all-but-abandoned hopyard back to life. She and Caro Anderson, another Home resident, had come up with the idea of adding brewing to the many money-making efforts Jo had tried in the constant battle to keep the Home afloat on a sea of expenses, and they’d succeeded beyond their wildest dreams. They weren’t out of the woods yet—far from it. The weather the last two summers had been terrible, cutting their harvest to almost nothing, but they’d made it through and this year looked to be much, much better. The hop plants were groaning with cones almost ready for harvesting. Could she really give all that up? Yes. Yes, she could. Harriet’s happiness was more important than anything else. And it wasn’t as if she’d be twiddling her thumbs all day. She’d have a new position to fill—vicar’s wife. She’d be busy seeing to Godfrey’s comfort as well as the needs of his parishioners. Her stomach twisted. The less she thought about Godfrey’s comfort, the better. Pen’s attention snapped back to the girls. The brim of Verity’s bonnet was askew, and Verity’s hands cradled her head. Harriet’s hands hefted a hymnal. “Touch me again and I’ll hit you harder,” Harriet hissed into the sudden quiet. The congregation sucked in its collective breath in horror—or in anticipation of a shocking, scandalous row. Godfrey cleared his throat. “Mama,” Harriet said as the heavy wooden church door closed behind them. “Not yet.” The odds were good that at least one of Godfrey’s flock would be struck by a sudden attack of curiosity and follow them. Harriet let Pen hustle her down the church steps, along the village green, over the bridge, and halfway up the hill to the manor before she protested. Then she dug in her heels and jerked her arm free. Pen stopped too, turned to face her daughter—and felt her heart seize. Harriet looked so much like Harry at that moment with her unflinching gaze, hard jaw, and fierce intensity. Pride, love, and worry started to churn in Pen’s belly. Such self-assurance and independence were admirable in a man, especially a man who was now an earl. They were far less of an asset in a young fatherless girl. Pen froze, mouth agape. Then her heart started to thump so hard she was afraid it would break free of her chest. Calm down. Verity can’t know. Little Puddledon is a small, obscure village in Kent. No one ever goes to London, and no one from London—or Darrow—comes here. We’re safe. Verity and her mother were from London. Her heart thumped harder. She had trouble breathing. Breathe. You can still bring this about. The moment Pen had realized she was increasing, she’d known she had to leave Darrow and never come back. Even if she’d been willing to marry the man her father and the earl had chosen for her, there could be no hiding who her baby’s real father was once that silver blaze appeared. Well, or worse, everyone would assume she’d consorted with Walter, and Harriet was just another of Walter’s whelps. The estate was littered with them. But then the streak hadn’t appeared. Year after year Harriet’s hair had remained as dark as night. Pen had begun to hope it would stay that way forever. She’d been relieved and, well, yes, also a little sad. To be honest, in her heart of hearts, she’d wanted some visual reminder of Harry. I used to tease him that he’d trapped a moonbeam in his hair. He’d been completely revolted by the notion. And then this year, shortly after Godfrey arrived in Little Puddledon, Harriet had taken ill. When she’d recovered, a thin ribbon of silver shimmered from her temple. It wasn’t terribly noticeable. When she wore a bonnet, or combed her hair in her usual fashion, no one could see it. Up until now, she and everyone else had accepted Pen’s fever explanation. Pen’s heart sank. Surely there must be others with the distinctive mark. Could she claim Harriet’s father was descended from the distaff side of the family? Had Harry’s father had a sister? She couldn’t remember. And that would just be adding one more untruth to the many she’d told already. Better to stick to her original story. She’d taken too long. Harriet had her father’s sharp intellect and unflinching courage. It was so very hard to find the words. Oh, blast. So many lies to unravel, though the one about having a husband lost to war had been Aunt Margaret’s idea. Pen had been too confused and frightened and sad when she’d landed on her aunt’s doorstep to object. And the story hadn’t been that far from the truth—Pen’s heart’s truth, at least. She’d felt married. She’d known from the beginning Harry wouldn’t actually marry her, of course—earls’ sons didn’t marry farmers’ daughters—but it hadn’t mattered. She’d loved him as only a naïve seventeen-year-old girl could—blindly, passionately, completely. Defiantly. And she truly believed he’d loved her—as much as a randy eighteen-year-old boy getting ready to go off to war could love anyone. No wife could have worried more for a husband than she had for Harry while he was on the Continent. She’d scoured every news report, terrified she’d see his name among the casualties. “Harriet . . .” Pen stepped closer. If she touched her daughter, if she put her arm around her, she could make her understand. But Harriet dodged her, backing toward the stile that would take her over the fence and off across the fields. Or would she have? Perhaps she’d hoped they could live forever in this happy fiction. And really, what did it matter? It wasn’t as if Harriet had wealth and security depending on her legitimacy. Girls couldn’t inherit their father’s titles or lands. Oh. Of course. Rosamund and Verity thought Walter was Harriet’s father. It was what everyone would think. No, she was done with lies. And she didn’t want Harriet thinking the profligate, cheating Walter was her father. Pen’s stomach turned again. Or that Pen had slept with a married man. Worse. When she’d conceived Harriet, Walter had not only been married, he’d had one daughter and another on the way. An odd look—some mix of confusion and shock—flitted over Harriet’s features. Pen reached for her again—and again Harriet backed away. She now had one foot on the stile. “So, so he doesn’t c-care about me?” Harriet’s voice wavered with pain and uncertainty. Dear God, Pen hated to see her strong, fearless daughter look so fragile. She would fix things. She’d marry Godfrey. Then Harriet would have a father and a room of her own. She wouldn’t have to be around that nasty Verity all the time. Wedding Godfrey would solve all their problems. Harriet’s eyes widened as her jaw dropped—and then anger twisted her features into a dark scowl. “You didn’t tell him?” The words were sharp and heavy with accusation. Harriet had grown up in Little Puddledon. She was too far removed from the peerage and polite society to understand how these things worked. Pen’s heart broke at the pain in Harriet’s voice. Perhaps that had been her real reason for not writing Harry—by not putting the matter to the test, she’d been able to keep alive a faint hope he would indeed care about their child. Silly. It was more likely Harry had followed in Walter’s footsteps—well, footsteps weren’t precisely what he’d have been following in—and had a raft of illegitimate offspring. “He’s asked you to marry him?” From Harriet’s tone, the man might just as well have asked Pen to dance naked down the church aisle. Harriet was shaking her head, looking distinctly ill. “Marry Mr. Wright?” she repeated in a hollow voice. “Y-yes.” This certainly wasn’t the reaction Pen had expected. “No, he’s not.” Godfrey might be a bit pompous and sanctimonious and, well, boring, but he wasn’t horrible. “Harriet!” Where had her calm, controlled daughter gone? “You’re not.” Now she was the one feeling ill. “And he won’t.” Godfrey was a vicar. Surely, he’d embrace charity. But Harriet was gone. She’d scrambled over the stile and was now running across the field, taking Pen’s heart with her. No. Harriet was like Harry in this, too. She needed time alone to come to terms with her feelings—she had had a lot of unpleasant things to deal with all at once. She’d come home when she was ready. Pen started back up the road to the manor, though now she felt as if she were dragging herself through treacle. Godfrey won’t really hold Harriet’s birth against her, will he? She scowled down at the dirt. I won’t let him. The moment she saw—or suspected—anything of that nature, she’d let the man know in no uncertain terms that she would not tolerate it. She would do anything for Harriet. Even lie. If he hears the gossip, I’ll deny it. She’d been taken unawares this time, but now that she knew what Rosamund and Verity were saying, she could come up with a convincing story, one that hewed as much to the truth as possible. She wasn’t an accomplished liar. She would have to keep the tale simple . . . .
Ah, now she had it. She’d say her dear departed Mr. Barnes was descended from a Graham by-blow, a female born on the wrong side of the blanket. Surely that would work. Godfrey had a powerful reason to believe whatever she said. He wanted her in his bed. She repressed a shudder and quickened her pace, forcing her thoughts to the safer topic of her hop garden. She’d check the plants when she got home and pluck off any nasty bugs she found lurking there. It wouldn’t be much longer before the cones were ready to harvest and she could stop worrying—about the hops, at least. If only she could pluck the nasty words and hurtful looks from Harriet’s heart as easily. Pen brushed off her skirts as she left the hopyard and headed up the path to the house. She’d spent the last—she glanced at her watch—almost three hours carefully tending her hop plants, keeping a sharp eye out for any sign of mildew or greenflies. So far, so good. If only raising a child was as straightforward. She bit her lip, trying to will away the worries infesting her thoughts as destructively as any garden pest, but no matter what she did, they kept coming back to devour her peace. Maybe she should have told Harriet the truth about her birth years ago, but she’d thought her too young to understand. Why did she need her life complicated with things that had happened so far in the past and which neither of them could change? No, the fault went further back than that. She should never have gone along with Aunt Margaret’s widow story—and yet it had saved her and Harriet years of being judged and excluded. What you really should never have done was let Harry under your skirts. Ha! Most of the time her skirts had been discarded long before Harry touched her. She smiled, remembering. That summer with Harry had been wonderful, the best thing—besides Harriet—that had ever happened to her. She’d never before—or since—felt so alive and, well, real. Everything—every feeling, every smell, every touch—had been so intense: brighter and sweeter than at any other time in her life. Instead of going through her days enduring or hoping for something in the future, she’d lived in the present, savoring each moment, storing it away to cherish later, after Harry was gone. She’d always known he was going. And then she’d got Harriet, and as hard as it was to be an unmarried mother, she’d never once regretted it or wanted to be free of her daughter. Harriet was a living piece of Harry, but she was also precious in her own right. Pen desperately wanted to go in search of her, but she knew talking to her now would do no good. In fact, it would likely make things worse. She had to let Harriet work things out on her own. She’d come to Pen when she was ready. She flicked a bead of sweat off the tip of her nose as another worry intruded. Is Harriet right? Will Godfrey think me a whore when he hears the rumors and wash his hands of me? Something that felt suspiciously like panic formed a tight knot in her chest. No, surely not, but she’d best not give the story time to reach him—if it hadn’t already. She glanced at her watch again as she entered the yard with the service buildings. She’d go down to the Dancing Duck in a little while and catch Godfrey as he was leaving after his big Sunday meal. Perhaps she could get him to propose today. She looked over to see Caro striding toward her from the brewhouse. “All right.” Good. She had some time before she had to leave to ambush—er, talk to Godfrey. Meeting with Jo would give her the chance to mention again the problems Verity was causing Harriet—not that anyone could have missed the drama in church earlier. “All still good with the hops?” Caro asked rather anxiously as they walked across the yard. “Thank God for that,” Caro said as she opened the door to Jo’s office. “Thank God for what?” Jo asked. She was sitting behind her desk, her big ledger open before her. Freddie, her brown and white spaniel, came over to be petted before returning to sprawl at her feet. “So far, the hops are doing well,” Pen said, taking the worn, red-upholstered chair she always did. “Don’t count the hops before they’re off the bine,” Pen warned. She wasn’t particularly superstitious, but she hated to tempt fate—even with crossed fingers. Caro was so ambitious, she sometimes lost sight of reality. “Anything we can do to bring in more money would be a good thing,” Jo said, her voice tight with worry. Oh, Lud. “Still no word from the new duke?” Pen asked. Jo had been fretting their support would evaporate ever since she’d read that the old Duke of Grainger and his family had succumbed to influenza. No need to panic yet. “They’re only two weeks late, aren’t they?” she asked. Unfortunately, that was true. Puddledon Manor had once belonged to Jo’s husband, Freddie, Lord Havenridge. He’d wagered it and all his other unentailed property on the turn of a card—and lost. And then like the coward he was, he’d promptly put a bullet through his brain. When the winner—the previous duke—had come round the next morning to forgive Freddie’s debt, he was appalled to find Jo a new widow with no one to turn to. He’d let her stay at Puddledon Manor and had contributed to her support for over a decade. “The old duke must have made some provision in his will for you—for us,” Pen said. The dog, recognizing his name, beat a tattoo on the floor with his tail. Freddie’s tail wagged faster and his brows rose. He put his paws on Jo’s knee and licked her face. “Now don’t slobber all over me, sir,” she said, laughing. Then she looked back at Pen and Caro. Unfortunately, Caro could also be a bit of an I-told-you-so. “Perhaps it’s just an oversight or a miscommunication that he’ll fix as soon as he’s aware of it,” Pen said. No, it was a good thing Caro had such big dreams. They might not always reach them—they definitely hadn’t the last two years with the poor harvests—but her dreams gave them all a goal. True. They’d tried taking in mending, knitting shawls, baking cakes, and any number of other domestic activities all with equally disappointing results. Either the women who lived at the Home weren’t enthusiastic and produced inferior goods, or the villagers preferred to do such things for themselves. It wasn’t until they turned to the old brewhouse on the manor grounds that they hit upon an income-producing scheme that met with enthusiasm on all sides. Caro was by far the . . . bravest businesswoman of the three of them. Pen opened her mouth to protest—and stopped. Did she truly want to get into the whole tale now? She glanced at the clock on the mantel. She needed to leave soon if she was going to waylay Godfrey. And she had to waylay him today. Clearly, time was running out. Pen sucked in her breath. Hearing Caro say it out loud like that . . . What she’d done with Harry sounded so sordid, but it hadn’t been. Pen wasn’t ashamed, and Harry hadn’t forced or tricked her. She’d chosen freely. She’d loved him—and she’d got her daughter, who was her life, from what they’d done together. She didn’t regret a single thing. “Your past—anyone’s past—is none of our affair,” Jo said in a calm, soothing tone as she sent Caro another speaking look. If Caro knew the truth, she’d not let me leave this room until I wrote a begging letter to Harry. No, Godfrey probably wouldn’t notice if she was angry or upset. He was not the most observant individual. But someone else might. No need to give the gossips another bone to chew on. She smoothed her skirt. Godfrey took his midday meal at noon each day and left the Dancing Duck at two after consuming a hearty plate of mutton and several glasses of Widow’s Brew. It was now one fifty-eight. She took another deep breath, adjusted her bonnet to what she hoped was a complementary angle, and, at precisely one fifty-nine, strode purposefully across the bridge toward the tavern. She’d timed things perfectly. The door opened just as she was passing, and Godfrey emerged. “Mr. Wright.” He couldn’t hear the hollowness in her voice, could he? Show some enthusiasm! Godfrey is the answer to your prayers. Why is he inspecting my bodice so thoroughly? She was used to him darting glances at it, but today he wasn’t even trying to mask his interest. Perhaps that was good. It might mean he was having trouble controlling his male urges—weak as they may be—urges that would provoke him to offer for her if she played her cards right. I never thought of Harry’s urges. With Harry, she’d thought only of love—and, well, her own urges. However, since she had no love nor, to be brutally honest, even the faintest urge where Godfrey was concerned, she would have to hope his animal instincts carried the day. My urges are all maternal now. The only thing—the only person I care about is Harriet. Unease slithered down her back and she hesitated. Had he stressed the word Mrs? Why? It must be my imagination. She rested her fingers on Godfrey’s sleeve, and his hand came up to cover them. Stop. This is Godfrey, remember. Stuffy, boring, mild-mannered, God-fearing Reverend Wright. She let him lead her down to the well-trodden path and along the stream toward the rectory. She had about ten minutes to charm him. That might not be enough time. Godfrey didn’t, and since he still held her hand against his arm, she could either pick up her pace or get dragged through the dirt. She picked up her pace. “Do you have someone waiting for you at the rectory?” That would be unfortunate, but there was nothing to be done about it. She would have to make the most of what time she had. He smiled down at her. In another man, his expression might be considered wolfish, but this was Godfrey. Perhaps his mutton hadn’t quite agreed with him. He was definitely panting now, and his hand squeezed hers almost to the point of pain. No, engagement was precisely what she was looking for and she wasn’t going to find it by turning tail and running. “You will. You will.” His voice was oddly husky. The unease that had slithered down her back earlier fluttered into her chest. Don’t be silly. This is Godfrey, the vicar. He’s harmless. Her heart sank as they passed the bench and she realized she’d been hoping that that had been Godfrey’s destination. Then they reached a point where the main path moved away from the stream. Godfrey veered off on a narrow, overgrown trail Pen had never noticed before, not that she’d spent any time exploring this area. There was no room to walk two abreast, so Godfrey towed her along behind him. “Where are we going?” Pen put up her free hand to keep from being smacked in the face by a branch Godfrey had just pushed by and hadn’t had the courtesy to hold for her. “Besides toward the stream.” At least there were no hills, rose-tipped or otherwise, between them and the water. “W-want wh-what?” She considered taking issue with his use of her Christian name, but decided to let it go this time. The fluttering had moved from her chest to her throat, making it difficult to keep her voice steady. He must have overimbibed at the Duck. The narrow path opened up into a small clearing with a large willow tree. Godfrey pulled her under the willow branches and then backed her up against the trunk. “Want this,” he said, and his lips—his wet, slobbery, flaccid lips—came down on hers. Right, Harriet. She would endure anything for Harriet, even this. Though thinking of Harriet in this particular situation made her think of Harry and how different she’d felt whenever he’d kissed her. Could she pretend Godfrey was Harry? No. Harry had never smelled of onions and garlic, and, more to the point, he’d never attacked her this way. He’d have noticed if she’d been at all reluctant and would have stopped at once. Not that she’d ever been reluctant. More times than not, she’d kissed him first. Ugh! He’s trying to force his tongue into my mouth! She locked her teeth together. Time for some shocked protest. She couldn’t risk saying anything—if she opened her mouth, his tongue would strangle her—so she shoved on his chest. Nothing happened. He might not even have felt the push. She shoved harder. Still nothing. At last! He lifted his head—and chuckled. He tugged her bonnet’s ribbons free, and then sent her hat sailing away. “Hey!” She turned her face to follow its trajectory. It landed, at a rakish angle, on a bush. It? This sounds like a proposal, but not one of marriage. “Eager?” She might be misunderstanding. Godfrey was a man of the cloth, after all. One would think he’d wait to engage in anything of a carnal nature until he had God’s blessing. His other hand planted itself on her hindquarters. “And I’m here to satisfy your needs—and mine.” He pulled her hard against him in such a way that his paunch no longer hid his, er, firm resolve. She forced that thought from her head. She had to focus. Why would Godfrey think she’d welcome illicit relations? He must mean marriage . . . . He certainly had an odd way of courting her. But he was a vicar. What else could he mean? She would find out. She certainly wasn’t going to let him maul her unless he intended to make her his wife. Everything inside her stilled. Dear God. He knows. Read the Widow's Brew Series FAQ for more information.